Kevin Smith's style of comedy is too unfocused to pull off a cinematic prank like "Tusk," a horror-comedy about a walrus-monster. Had Smith been more disciplined, the film's deliberately absurd plot twists might have been more alienating, and funny. But even a Kevin Smith apologist like myself will readily admit that "discipline" and "Kevin Smith" do not belong in the same sentence. "Tusk" is bearable thanks in no small part to its game cast, particularly character actor Michael Parks's Vincent Price-esque baddy. And yes, Smith does get in a few good scares, especially during the movie's creature scenes. But as it is, "Tusk"'s sophomoric gag is rarely as funny or creepy as it could have been. "Tusk" is what you'd get if you wrote a comedy inspired by both "The Human Centipede" and Roger Corman's Edgar Allan Poe adaptations. Shock jock podcaster Wallace Bryton (Justin Long) visits Manitoba to interview "The Kill Bill Kid," a YouTube star that gets famous after a video of him cutting his own leg off goes viral. But fate intervenes, and Wallace pursues another seemingly easy target: Howard Howe (Michael Parks), a paralyzed adventurer with a yen for flippered marine mammals. Unfortunately for Wallace, a selfish schlub who somehow becomes more annoying every time he talks, Howe's not as helpless as he seems. This leaves Wallace's girlfriend Ally (Genesis Rodriguez) and co-host/best friend Teddy (Haley Joel Osment) to rescue Wallace from Howe. A younger Smith might have sympathized with Wallace, but the current Smith really goes after him for being as hatefully jaded as, uh, himself (Wallace is clearly a stand-in for Smith as "Tusk" originated from Smith's Smodcast podcast). Through a series of flashbacks, Smith makes Wallace cartoonishly obnoxious, especially when Ally whines to Wallace about how much he's changed, and that she "[misses] the old Wallace." These scenes are especially tedious since Smith inevitably loses interest in taunting Wallace. For example, he really likes mocking Canadians, who all say "Eh" or "Aboot." Thankfully, Smith's Mike Myers-worthy gags aren't lethal, save for every scene featuring Guy LaPointe (Johnny Depp, doing a very bad Johnny Depp impression), a Clouseau-like Canadian detective. Thankfully, Wallace isn't Smith's main target. As in "Red State," a slightly-superior experiment in terror, Smith's eye is on Parks, a legitimately impressive performer. Smith doesn't like Howe either, as we see in the scenes where Howe blames his psychological instability on a never-ending gauntlet of child abuse. But that's besides the point. He does like Howe enough to give him several theatrical soliloquies, but those speeches make it impossible to invest in the villain as a legitimate threat. 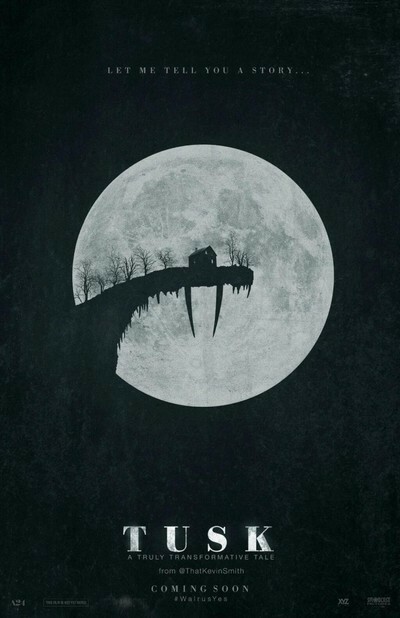 Which is a problem since "Tusk" works better as a horror movie than a comedy. Most of the scenes in which Wallace realizes how helpless he is are effectively creepy, particularly ones where Howe mocks Wallace by wailing, moaning and snarling at him. Parks isn't to blame for his role's shortcomings, including bloated scenes of dialogue that verge on Shakespearian. Smith doesn't know when to trust him, and let his line-delivery establish both the absurdity and horror of being a walrus-obsessed loner. It's not surprising that Smith's characterizations and dialogue lack subtlety given the type of broad comedy that Smith has practically made his brand. But somehow, watching him fail to make something interesting of "Tusk" is more disappointing than any of his other post-"Chasing Amy" misfires.